​3 to 4 hrs. time interval between each coat at 30°C. ​Sand with emery paper no. 320 or 400 between application of each finish coat of glossy or matt. 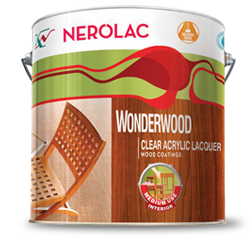 ​Nerolac Wonderwood Clear Glossy - 85° minimum.